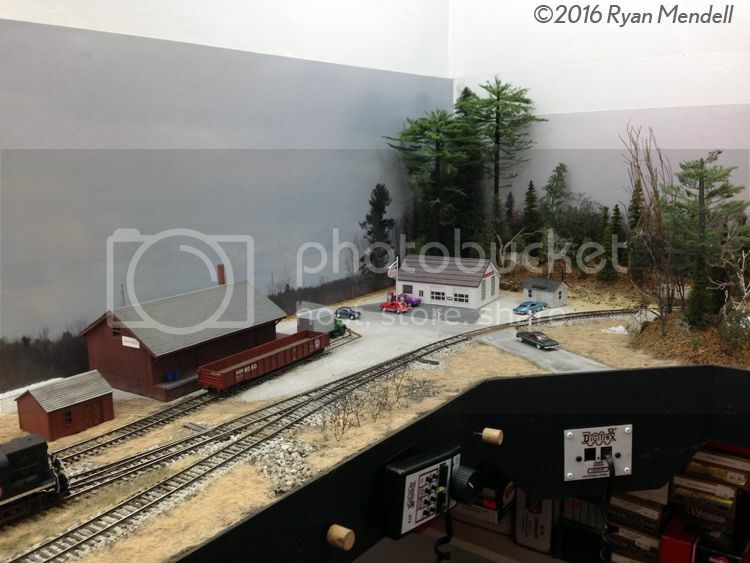 I’ve written about Ryan’s layout previously on this blog. Follow this link for more. Thanks for the plan and tour, Ryan – I’m sure many people looking for achievable layout ideas will appreciate the information and inspiration! On Saturday night, some friends and I ran trains on the excellent CP Rail layout built by Bob Fallowfield. I’ve written previously about the layout on this blog, but I want to focus on one town in particular – Putnam, Ontario. As part of the session, Ryan Mendell and I worked a turn out of Woodstock to St. Thomas. Putnam was part of our assignment, and Bob warned us it would take about 90 minutes. What the schematic does not show, however, is how much time is required to block and move cars per prototype practice. Putnam offered several challenges. First, that long track for the mill complex has three distinct spots, so it’s not what Bob refers to as a “blow and go” industry: You can’t just shove a cut of cars in and be done with it. In our train, we had cars for certain spots, and other cars to be held at Putnam until the mill needed them. When we arrived at Putnam, we also had a number of cars sitting on the run-around. Some of these needed to be spotted, while others were to be held. Furthermore, we had lifts to make – but while we would lift these on the outbound trip, since Putnam’s spurs are trailing points when headed to St. Thomas, we would leave the lifts at the east end of the run-around (at right in the photo below) to collect on the return trip to Woodstock. Further complicating matters – but in a realistic fashion – is the other customer in Putnam: A propane dealer. Propane cars are dangerous – whether empty or full – and needed to be handled in specific spots in the train. 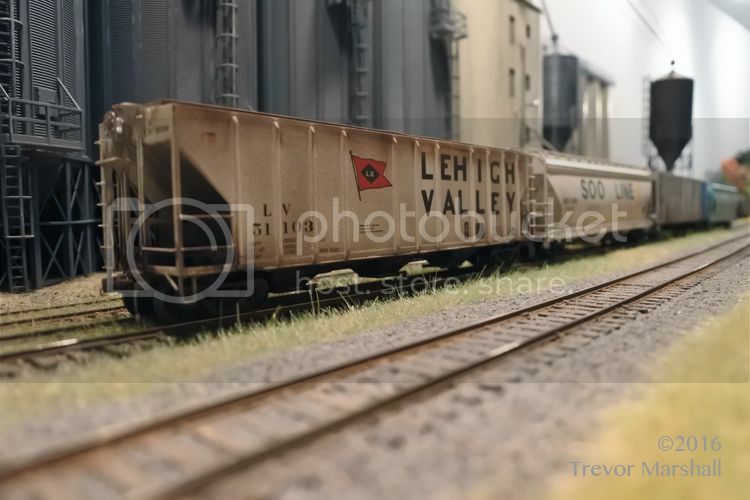 Rules include not spotting the cars next to either locomotives or the van (whenever possible), and not marshalling next to open-topped loads that might puncture the tank car should a derailment occur. Ryan and I spent at least 90 minutes switching Putnam – and it never felt like “playing trains”. The work was realistic, and therefore real to us. It was satisfying to accomplish this safety, and efficiently. As we worked Putnam, it occurred to me that this simple place – just four turnouts – could be the basis for an entire layout. A train staged on a single track at right on my diagram (above) would enter the scene from Woodstock. The crew would spend 60-90 minutes sorting out the mill and switching the propane dealer, then prep its outbound cars to be collected on the return trip. The train could then head west (left) to St. Thomas – in reality, another single track staging area. There, it would be switched with the 0-5-0. 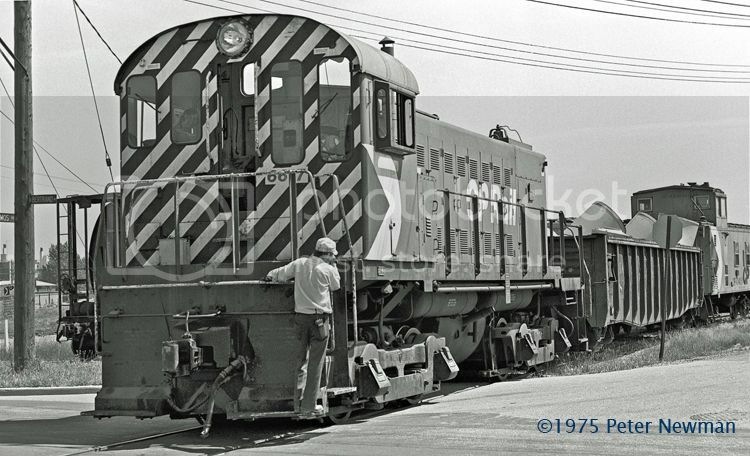 Cars for St. Thomas would be removed, while cars returning to Woodstock would be re-ordered behind the locomotive. The train could then reappear in Putnam from the west (left) and do its eastbound lift – just to complete the sequence. As Ryan and I found on our return trip, we had to do some re-ordering of our lift in order to protect an empty propane tank car from some open loads we’d collected in St. Thomas. 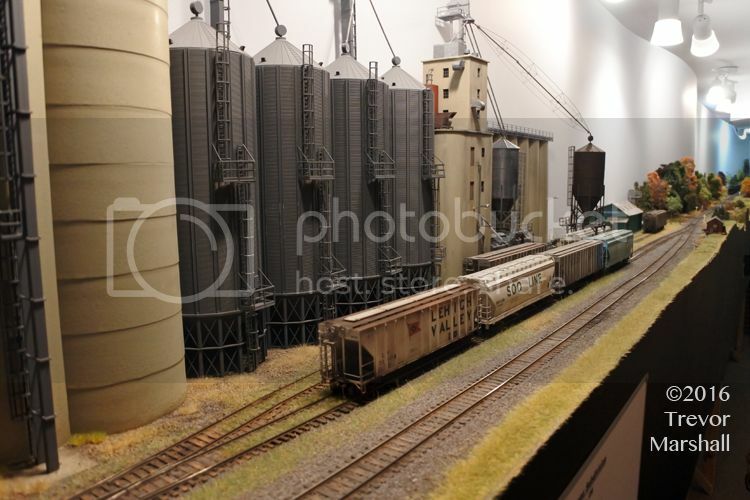 Such a single-industry layout would be particularly impressive in a larger scale, like O, where one could experience the presence of a cut of grain hoppers rolling into place next to a truly massive structure. 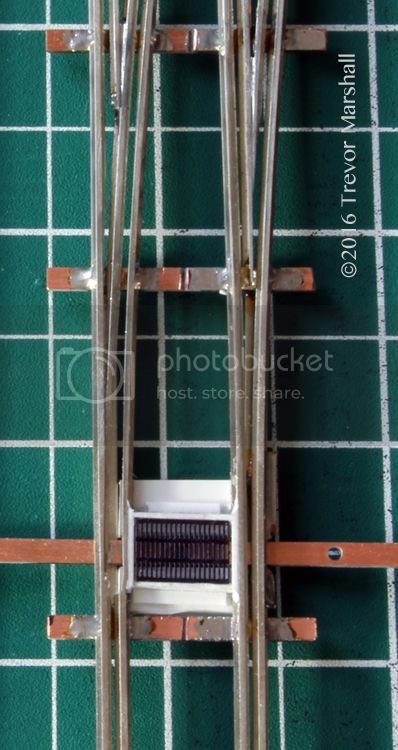 Bob’s HO scale rendition of the elevator was already imposing, as the photos show. 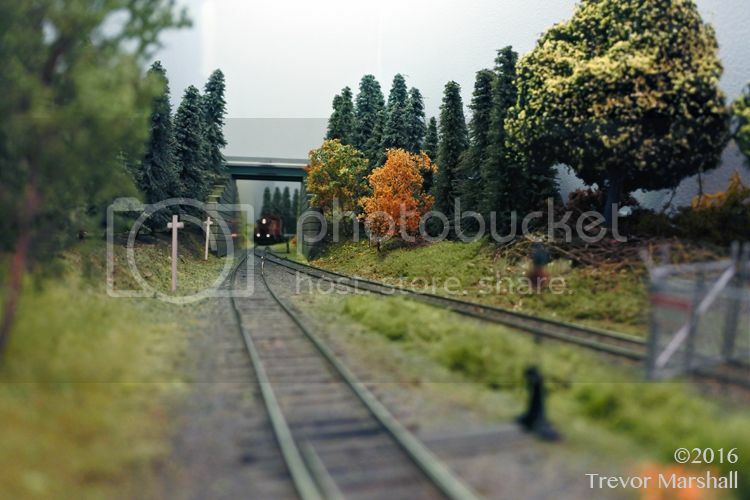 Nothing says big city industrial railroading like trackage in the street. So recently, when I designed an achievable layout for my friend Regan Johnson based on CP Rail’s industrial trackage in Scarborough, Ontario, I added a bit of street running, including a pair of in-street turnouts. The prototype did not have any street running, as far as I can tell – but it could have. More importantly, the stretch of in-street trackage will be a highlight on the layout – visually and operationally – so it was an idea too good to pass up. The turnouts are both Number 6, in Code 70. They have a single point, and I used Code 70 to create full-length guard rails throughout the turnouts. These guards will allow us to pave the street without getting plaster (or spackling, or whatever we use) into the flange ways. From there, it was simply a matter of cutting lengths of rail to use as guards and fitting them in place by measuring off the running rails. 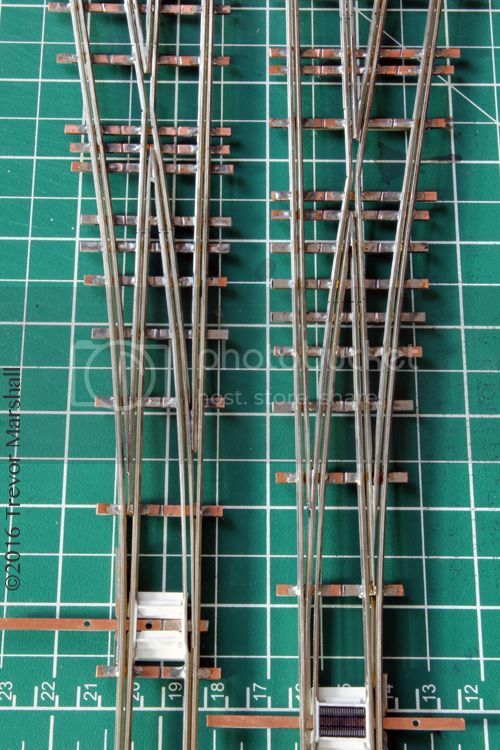 An NMRA track gauge worked fine for spacing the guards while soldering them in place. The throw bars required special attention. 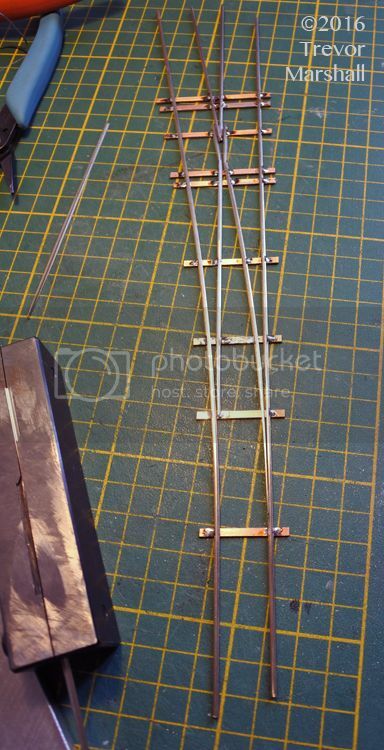 I soldered the single point to the throw bar, then used spare PC ties to trap the throw bar under the opposite rail so that it could not waggle back and forth. Finally, I built up some dams out of styrene to keep the paving out of the throw bar – and used a length of photo etched Farr grille for an EMD F-unit to represent an in-street grate over the throw bar. This is removable so Regan can install and service the turnout, as needed. This was a fun project that required a lot of problem solving on my part, and each turnout required three to four hours of pleasant time at the workbench. Anybody who can build a standard turnout using Fast Tracks tools can do one of these as well. They’ll help set the scene on Regan’s layout, so I’m glad I included them in the design.